Peppermint Bark is sweet layers of dark and white chocolate topped with crushed peppermint candies and broken into pieces. EASY to make and no baking required! We absolutely LOVE making holiday treats, and today everyone is in the kitchen working sipping on Eggnog while baking Gingerbread Cookies and making Pretzel Turtles. 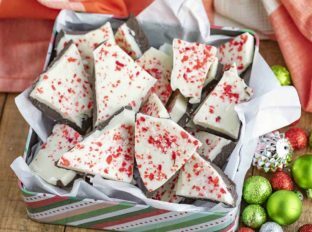 Peppermint Bark is a no-bake recipe that’s incredibly easy to make, and the PERFECT project to keep the kids entertained on the holidays. There’s a lot of different flavor combos you can go with here. For this recipe, the bottom layer is a sweet dark chocolate or milk chocolate, and the top is a peppermint flavored white chocolate. 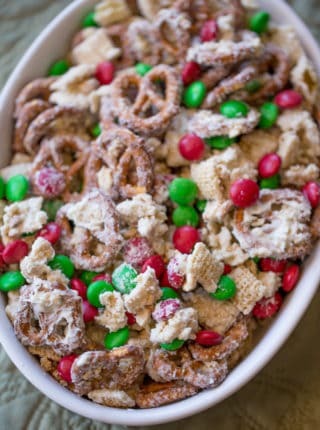 If you have kids they’ll love to help sprinkle the candy on top! I have learned through experience with this recipe that you want to use either parchment paper or a nonstick foil-lined baking sheet, to make the chocolate easier to lift off of the pan later. You can even use a thin coating of coconut oil on the bottom to prevent the chocolate from sticking to the pan. If you have extra melted dark chocolate, drizzle decoratively on top before you refrigerate. You’ll make this one of your go-to holiday desserts, I promise! HOW LONG DOES THIS PEPPERMINT BARK RECIPE KEEP FOR? Peppermint bark will keep in an airtight container on the counter for about 1 1/2 – 2 weeks. If it’s really hot, wrap tightly and store the bark in the refrigerator. CAN PEPPERMINT BARK BE FROZEN? You can freeze peppermint bark when wrapped tightly and put in an airtight container. Thaw the bark in the refrigerator to avoid condensation on the chocolate. 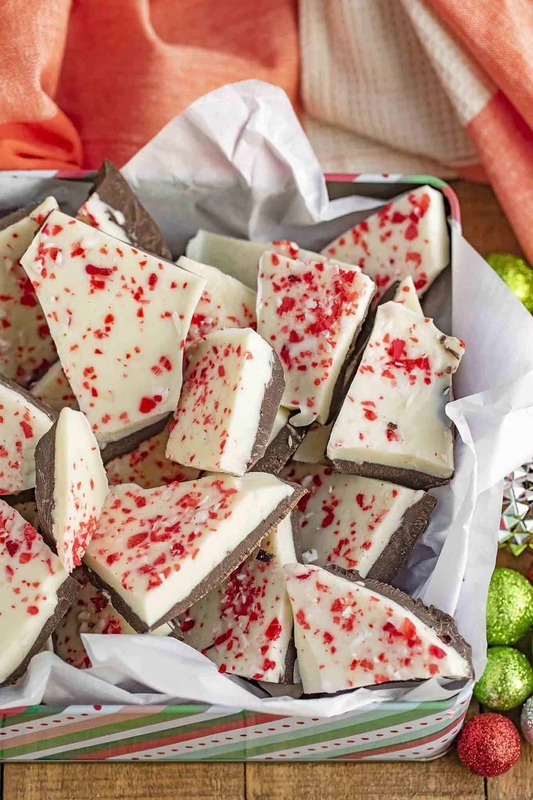 HOW DO YOU MAKE WHITE CHOCOLATE PEPPERMINT BARK? 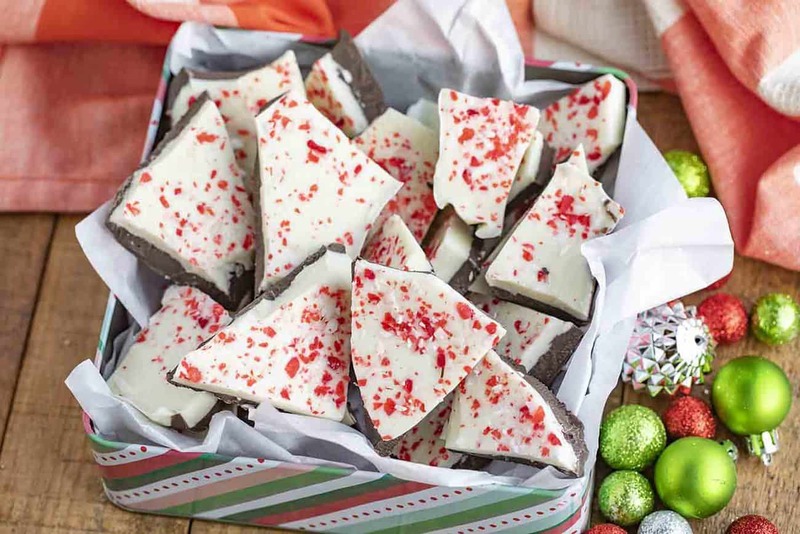 This peppermint bark recipe uses a mix of dark chocolate and white chocolate chips. 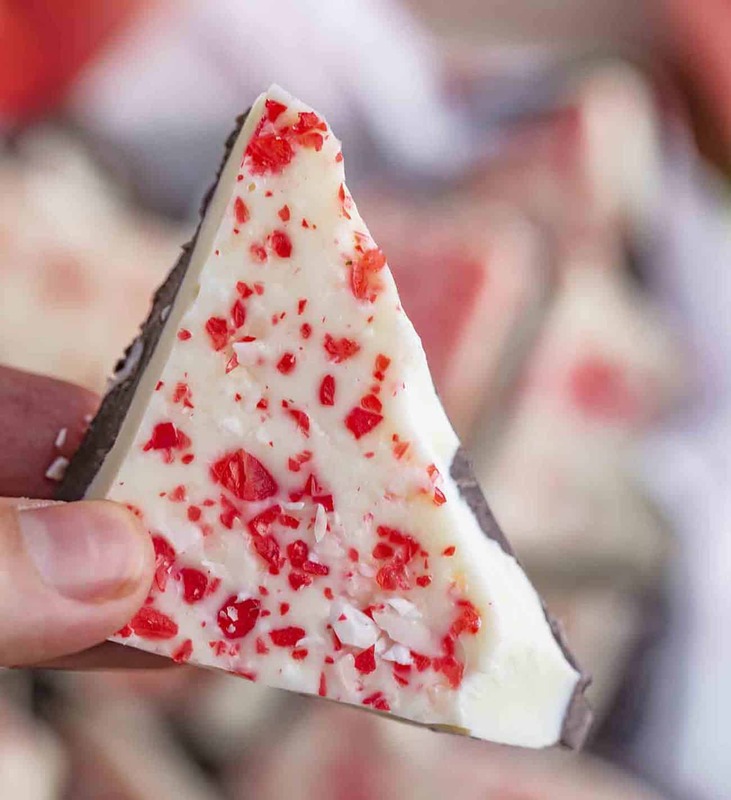 For an all white chocolate peppermint bark, sub the dark for more white chocolate. Add the same amount of peppermint extract, and crushed peppermint candies or candy canes to add some red color to the bark. HOW TO CUT PEPPERMINT BARK? Pull the parchment paper up (use a spatula to help) and hold the peppermint bark in your hands. Make sure it’s had enough time to harden, this step is important! 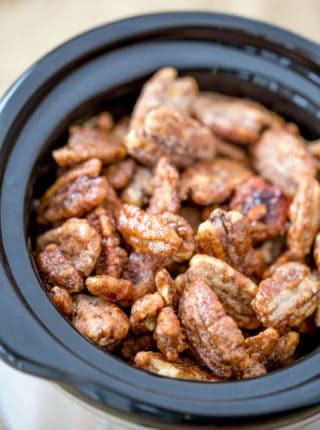 Carefully break into large pieces and place in an airtight container. You can also cut the bark into squares using a sharp knife, being careful not to crack the chocolate into small pieces with too much pressure. HOW TO KEEP PEPPERMINT BARK FROM SEPARATING? Allow the candy to come to room temperature before before trying to cut or break the bark. This gives the chocolate a change to settle and come together instead of separating. Make sure not to let the dark layer get too cold before adding the white chocolate layer, this creates too much of a separation between the layers. WHAT OTHER BARK CAN I MAKE? Leave out the peppermint extract and candy canes entirely and instead drizzle with salted caramel sauce. Then use a spatula to make a swirl pattern for salted caramel chocolate bark. Leave out the milk chocolate and use all white chocolate with a teaspoon of lime extract, then top with chopped candied lime zest for a key lime pie bark. Leave out the peppermint extract and top with crushed graham crackers to make a s’mores bark! Layer mini candy canes on top of bark before it sets for a more Christmas decorative look. If you use candy canes, cut each piece around so you have one per square. Use a microwave-safe bowl to melt the chocolate. If you don’t want to use a microwave, you can also melt the chocolate in a double boiler on the stove. You can use crushed candy canes in place of the hard peppermint candies. Let the dark chocolate layer cool on the cookie sheet before adding the peppermint white chocolate layer to keep the colors from combining. You can use a similar technique to layer dark chocolate and peppermint fudge for another holiday treat! If you love this recipe try Peppermint Oreo Balls, too! It’s a great way to use up more of that crushed peppermint candy. Line a 9x13 baking pan with parchment paper and melt the dark chocolate chips in the microwave in 30 second increments in a glass bowl until fully melted (stirring each time, about 90 seconds). Pour the dark chocolate onto the baking pan and spread, then melt the white chocolate chips in the microwave in 30 second increments until fully melted then add in the peppermint flavor. Pour the white chocolate chips over dark chocolate chips carefully and evenly, then top with the crushed candies, pushing them in slightly before cooling the pan in the refrigerator until fully hardened (about 30 minutes). You can use chocolate chips, or melting chocolate to make the melting easier. I love how festive & pretty this bark is! Chocolate & peppermint is the best combination! I love giving this as gifts! This is my favorite around the holidays! I love that I can make it at home! 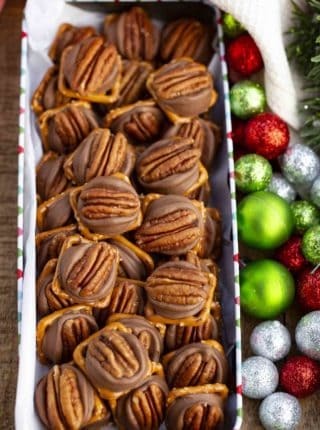 This is one of my favorite holiday treats! 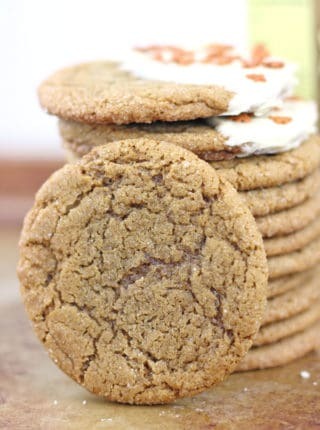 So easy and love that there are only 4 ingredients! Peppermint bark is one of my favorites this time of year! Although I have never attempted making it myself – I will have to give it a try! It’s so easy! Definitely give it a try! I made this last night with my kids and it’s great! We used peppermint white chocolate for that layer, so we didn’t add any extra peppermint and it turned out perfect! Thank you! Yay!! So glad you guys loved it!